With this recipe, you can make a homemade version of the classic Vegeta Gourmet Seasoning, produced by the Croatia-based Podravka company. It's a very popular ingredient in many Eastern European recipes and adds a savory kick to a variety of foods. While the seasoning mix is incredibly useful, it contains monosodium glutamate (MSG), which some people are sensitive or allergic to. This MSG-free recipe for a homemade substitute is adapted from the Thermomix Everyday Cooking Cookbook created by the makers of Thermomix. If sodium intake is also an issue, you'll want the recipe for an MSG-free and salt-free Vegeta substitute. Making your own Vegeta is rather simple. It's a basic dry seasoning mix of dehydrated carrots, turmeric, garlic, and salt. It can be used on a variety of foods, from pork to chicken, even shrimp. Once you discover the difference a little Vegeta makes in food, you'll be using it all the time. 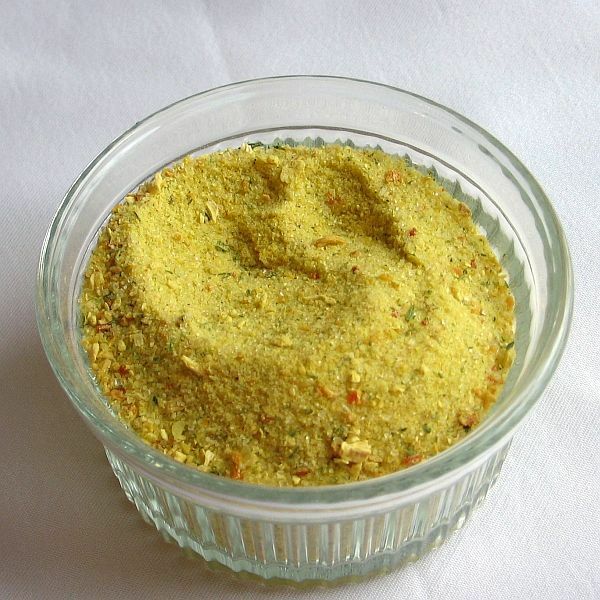 Mix dehydrated carrots, turmeric, garlic powder, and sea salt by hand in a medium bowl or pulse ingredients briefly in a food processor until mixed. Don't overprocess because you want the carrots to retain their identity. If desired, for variety, add dried dill, parsley, or other dried herbs and spices. Store at room temperature in a tightly covered jar or another container. What can you do with your homemade Vegeta? Quite a bit and to give you inspiration, here are a few dishes you'll definitely want to try. Romanian Pork and Potato Stew: This easy, one-pot casserole can be whipped up the night before and left to flavor overnight in the fridge. The next day, serve it over a cornmeal porridge known as mamaliga. Croatian Shrimp Scampi: Here's another easy recipe for a shrimp stew that can be on the table in about 45 minutes. It is an example of buzara-type cooking which means it is cooked with olive oil, wine, garlic, breadcrumbs, and fresh herbs. Hungarian Chicken Paprikash: Classic sweet paprika-flavored chicken stew can be made with boneless chicken or bone-in chicken parts which get a boost from Vegeta seasoning. Polish-American Sausage, Potato, and Cabbage Casserole: This hearty one-pot dish comes together quickly and is perfect for tailgating, Super Bowl parties, and informal entertaining. It's even better reheated, so it's perfect for school-night dinners. Croatian Bean Soup: This soup is so thick it's called a stew in Croatia. It can be eaten as a main meal or as a side and is best when served with a hearty bread. Polish Barley Soup: This is known as krupnik in Polish and it is considered one of the top 10 soups in Poland. There are unlimited varieties, including Jewish vegetarian, others based on beef or chicken stock, and some with bacon or spare ribs for added flavor. While the use of barley is the common denominator among these soups, the vegetables can range from cabbage to celeriac to leeks.